One of the most important challenges for a director (along with the cinematographer and editor of any given film) is to create the proper mood for the story. Mood may be more important than words, because words come out of—or are contextualized by—mood. Mood is ephemeral, but it helps establish point of view and orients us in the dream-space of the film. With all of the things that "Christmas, Again" (written and directed by Charles Poekel in his feature debut) does well (and it does almost everything well), the most striking thing about it is its evocation of an extremely specific mood. Once we settle into it, and it happens early, everything else becomes possible. 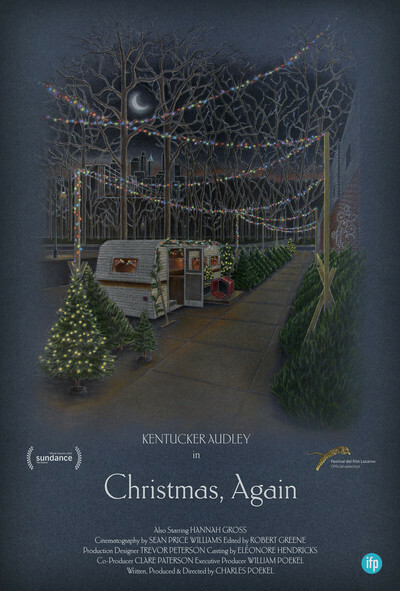 The lead character of "Christmas, Again" is named Noel (Kentucker Audley)—too cutesy a name to be believed, but it's skipped over like a pebble jumping across a pond. Noel spends most of his year working construction "upstate" but every Christmas time, he is one of those guys you see on almost every corner in New York, selling Christmas trees (plus wreaths, stands and lights). It's seasonal work, and post-Christmas, those guys vanish suddenly and then re-appear the next year. Poekel himself worked this seasonal job, and the film is great in showing how it all operates. Noel works the night-shift and oversees his two day-shift workers. None of these events are highlighted in a way that telegraphs "Here is the plot." "Christmas, Again" asks us to submit to the mood because that is where the profundity and emotion exists. New York is narrowed down to one corner, but on that corner a bustling diverse life occurs. Cinematographer Sean Price Williams, who helped shoot Albert Maysles' "Iris," and also shot indie hit "Listen Up Philip", often blurs out the background, fuzzed-out colored strings of lights filling up the space behind people's faces. The light is harsh in the morning, and dark blue at night. You can feel how cold it is. Noel has interactions with various customers: an impatient guy with a Bluetooth who takes pictures of various trees to text to his wife ("Hold the tree straight," Bluetooth guy commands), a seemingly flirtatious woman who admires the holly Noel put in the wreaths, a woman who asks "Do you have the Obama tree from Ohio? ", and an intense guy who asks, "Do women like Douglas fir or Balsam fir better?" Some of the interactions have more reverb than others, but they remain isolated incidents with their own internal tensions and a strong cumulative effect. One night, a guy comes up behind him and punches him in the head with no warning. Later Noel admits, "I been punched before" and you believe it. Kentucker Audley is a naturally charismatic actor. In "Kurt Cobain: Montage of Heck," Courtney Love observes that her husband "had no idea he was as good-looking as Brad Pitt," and you get the sense that Noel is the same way. His handsome face flickers with emotions, gone in a flash. When he does show humor, it is only in his eyes, but it's there, a slight wince accompanying. Audley draws you in in the way the old movie stars used to do: his emotions are clear and mysterious at the same time. Loneliness does not express itself in language. Loneliness is the air Noel breathes. It's in his posture. There are glimpses of unexplained strangeness: In the trailer, Noel listens to what seems to be a tape of an old-timey melodramatic radio show. He keeps pills (for anxiety? pain? sleep?) in different windows of a cheap Advent calendar, popping one a day. When Lydia (Hannah Gross), a drunk girl he helps one freezing night after finding her passed out on a bench in the park, with only one shoe, and gum tangled in her hair, shows up the next day with a pumpkin pie she baked to thank him, he's not sure how to react. A more conventional film would have had Lydia be the quirky girl who helps Noel find joy in the Christmas season. "Christmas, Again" resists. Lydia moves out of the film. She returns, and leaves again. The two try to play cards. She tries to talk to him. He is kind but remote. Silence dominates but it's full, not empty. All of this may sound rather dull. But it's not. It's a beautifully observed film without any overt message (thank goodness) but drenched in melancholy and silence and cold. Things sometimes resolve themselves, gently, only it's fragmentary, and none of it is "the point." The point is that Noel is a guy living a specific life in a specific season, dealing with emotions that are all over his face but never verbalized. There is no self-pity, no maudlin catharsis. The film has the courage of its convictions and confidence in its mood. What a pleasure to watch a film that resists being about only one thing. That resists the conventional story. That lets us enter into the life of another. "Christmas, Again" is also available on Fandor today.